Whether you’re an individual traderCareersSearch CFI's career resources library. We've compiled the most important career resources for any job in corporate finance. From interview prep to resumes and job descriptions, we've got you covered to land your dream job. Explore guides, templates, and a wide range of free resources and tools or a financial or investment professional, the foreign exchange (forex) market, also known as the currency or foreign currency market is where the money is. Forex trading amounts to approximately $5 trillion (yes, trillion, not billion) per day. By comparison, the approximately $700 billion a day bond market and $200 billion a day in stock trading worldwide appear relatively small in size. The total daily value of all the stock trading in the world equals just about one hour’s worth of trading in the forex market every day. Governments, through their central banks, are also major players in the forex market. The central bank of a nation will often adopt large positions of buying or selling its own currency in an attempt to control the currency’s relative value in order to combat inflation or to improve the country’s balance of trade. Central bank interventions in the forex market are similar to policy-driven central bank interventions in the bond market. Large companies that operate internationally are also substantially involved in forex trading, trading up to hundreds of billions of dollars annually. Corporations can use the forex market to hedge their primary business operations in foreign countries. For example, if a U.S.-based company is doing a significant amount of business in Singapore, requiring it to conduct large business transactions in Singapore dollars, then it might hedge against a decline in the relative value of the Singapore dollar by buying the currency pair Usd/Sgd (US dollar vs. Singapore dollar). Last, but certainly not least, are individual forex traders, speculators who trade the forex market-seeking investment profits. This group includes a disparate cast of characters, from professional investment fund managersCareersSearch CFI's career resources library. We've compiled the most important career resources for any job in corporate finance. From interview prep to resumes and job descriptions, we've got you covered to land your dream job. Explore guides, templates, and a wide range of free resources and tools to individual small investors, who come to the market with widely varying levels of skill, knowledge, and resources. The forex market trades fluctuations in the exchange rate between currency pairs, such as the euro and the US dollar, which is stated as Eur/Usd. In the quoting of exchange rates, the first currency in the quotation is known as the base currency and the second currency is the quote currency. The exchange rate for a currency pair appears as a number like 1.1235. If the pair Eur/Usd is quoted as 1.1235, that means that it takes $1.12 (and 35/100th) in US dollars to equal one euro. The most widely traded currency pairs are, naturally enough, those involving the currencies that are most widely used worldwide – the US dollar (USD), the euro (EUR), the British pound (GBP), and the Japanese yen (JPY). Generally, the smallest fluctuation in an exchange rate between two currencies is called a “pip”. With most currency pairs, which are quoted to four decimal places, a pip equals 0.0001. The primary exception is Japanese yen currency pairs that are only quoted to two decimal places so that a pip equals 0.01. Many brokers now quote to five decimal places, with the last number signifying a fractional 1/10th of a pip. 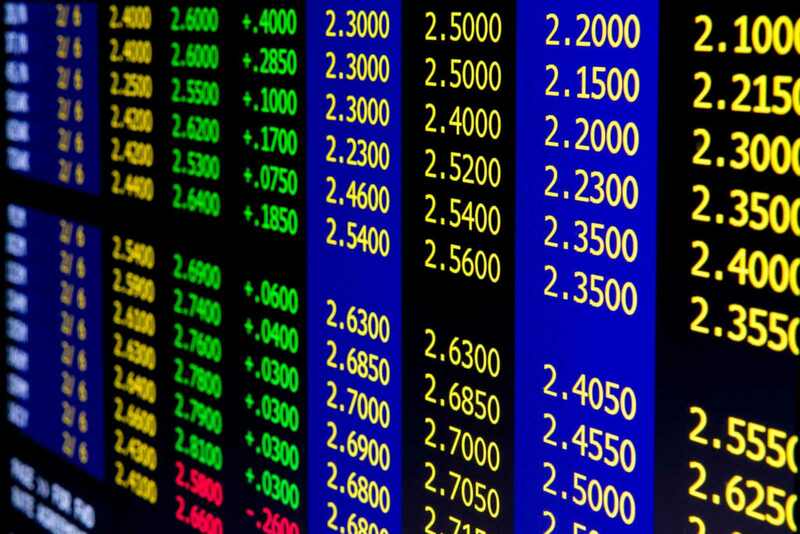 The value of a pip depends on both the currency pair being traded and what lot size is traded. For one standard lot, a pip commonly equals $10 (US); trading mini-lots, a pip equals $1; and trading micro-lots, a pip equals 10 cents. The value of a pip varies slightly depending on the currency pair being traded, but those figures are roughly accurate for all pairs. One of the major attractions of forex trading is the unparalleled leverageLeverage RatiosA leverage ratio indicates the level of debt incurred by a business entity against several other accounts in its balance sheet, income statement, or cash flow statement. Leverage ratios include debt/equity, debt/capital, debt/assets, debt/EBITDA, and interest coverage. This guide has exmaples and Excel template that is available to forex traders. Leverage is the ability to hold a market position with only a fractional amount of the market value of the instrument being traded. This fractional required deposit amount to hold a trading position is known as “margin”. Leverage is expressed as a ratio that shows the amount of margin required by a broker to hold a position in the market. For example, 50:1 leverage means that a trader only needs to put up 2% of a trade’s total value to initiate a trade. Some brokers offer up to 1000:1 leverage. High amounts of leverage mean that forex traders can utilize a small amount of investment capital to realize sizeable gains. For example, with an investment of only around $10, trading micro-lots with 500:1 leverage, a trader can realize a profit of approximately $20 (or roughly double his investment) on just a 20-pip change in the exchange rate. Given that many currency pairs often have a daily trading range of 100 pips or more, it’s easy to see how traders can realize substantial gains from very small market movements, using minimal amounts of trading capital, thanks to leverage. However, traders have to keep in mind that just as leverage magnifies profits, it also magnifies losses. So a trader might only commit $10 of his total trading capital to initiate a trade, but end up realizing a loss substantially greater than $10. The extremely high volume of trading that occurs in the forex market each trading day makes for correspondingly high levels of liquidity. High liquidity makes for low bid-ask spreads and allows traders to easily enter and exit trades throughout the trading day. The bid-ask spread on major currency pairs, such as GBP/USD, are typically much lower than the bid-ask spread on many stocks, which minimizes transaction costs for traders. For large institutional traders, such as banks, high liquidity enables them to trade large positions without causing large fluctuations in price that typically occur in markets with low liquidity. Again, that makes for lower total trading costs and thus larger net profits or smaller net losses. Higher liquidity is also considered by many traders to make markets more likely to trade in long-term trends that can more easily be analyzed with the use of charting and technical analysis. As previously noted, many of the most widely traded currency pairs often have a daily trading range of up to 100 pips or more. This daily volatility makes for significant opportunities to realize profits simply within the range of price fluctuations that occur within a normal trading day. The advantage of volatility is enhanced by the fact that in forex trading it is just as easy to sell short as it is to buy long. There are no restrictions on short selling such as those that exist for trading stocks. A wide daily trading range, with equal opportunities to profit from both buying and selling, make the forex market very attractive to speculators in general and day traders in particular. There are two basic strategic approaches to forex trading – fundamental and technical. Fundamental analysis trading is generally more favored by long-term traders, those who buy (or sell) and hold a currency pair for an extended period of time. Fundamental analysis is analysis that is based on economic conditions, both within specific countries and globally. Throughout most trading days, various economic reports from the different countries in the world are released. The indications, positive or negative, coming from such reports are the main drivers of major changes in exchange rates between currency pairs. If, for example, several positive reports on the United Kingdom’s economy are issued within a three-month time frame, that is likely to increase the value of Gbp against other currencies such as the Eur and Usd. Among the most significant economic reports issued, those most likely to impact the currency markets, are gross domestic product (GDP), the consumer price index (CPI), the producer price index (PPI), various employment and consumer confidence reports, and the policy decisions of central banks. Fundamental analysis may also be based on global economic trends. For example, if the usage of cotton is rising worldwide, then the economies of countries that are major cotton producers can be expected to benefit, and the relative value of their currency may be expected to increase. Interest rates, which are set by a country’s central bank, are a major factor in determining the relative value of a currency. If investors can realize significantly higher gains from money held in interest-bearing accounts in the United States than from interest-bearing accounts in other countries, then that makes the US dollar more attractive and therefore likely to increase in value relative to other currencies. Many forex traders favor technical analysisTechnical Analysis - A Beginner's GuideTechnical analysis is a form of investment valuation that analyses past prices to predict future price action. Technical analysts believe that the collective actions of all the participants in the market accurately reflect all relevant information, and therefore, continually assign a fair market value to securities. in determining the trading positions they adopt. Technical analysis – analysis based on charts of price movements in a market, with the aid of various technical indicators – is generally favored by speculators and short-term or intraday traders, although long-term traders may also utilize technical analysis. Technical analysis is simply analysis that is based on past price movement and market behavior (such as volume or volatility), Technical indicators include trend indicators such as moving averages, and market strength, or momentum, indicators such as the relative strength indicator (RSI). A basic technical trading strategy might be something as simple as buying a currency pair when the price/exchange rate is above a 50-period moving average, and selling the pair when it is below the 50-period moving average. Some technical traders utilize a single technical indicator for trades, while others apply multiple technical indicators as trade indicators. For example, the simple technical trading strategy just outlined, using a moving average, might be combined with a momentum indicator such as the MACD, with trades only being initiated when both certain price levels and momentum levels exist. Technical traders analyze charts of varying time frames based on the trader’s individual trading time frame preference. Traders who make very quick, in-and-out of the market trades, may concentrate their analysis on a 5-minute, or even 1-minute time frame chart. Traders with a longer term trading time frames are more likely to apply technical analysis to hourly, 4-hour, or daily charts. The forex market is one of the most attractive markets for traders. Forex trading has exploded in popularity since retail trading by individual small investors became more readily available around the turn of the century. The ability to open a trading account with amounts as small as $50-$100, and the possibility of then turning such a small amount into millions within just the space of a few years, is an almost irresistible draw. However, the lure of “easy money” from forex trading can be deceptive. The fact is that the majority of forex traders lose money, and only a small percentage of traders are consistent winners in the currency trading market. The keys to success in forex trading include not just a good, sound trading strategy, but exceptional trading discipline, patience, and risk management. A number of super-successful forex traders have summed up the secret to their success as something like, “Just avoid taking big losses until you stumble into a huge winner. Most traders fail because they gamble away all their trading capital and don’t have any money left to trade with when a ‘million dollar’ trading opportunity finally comes around”. Best Stock SimulatorsThree Best Stock SimulatorsThe best stock simulators allow the user to practice and refine their investment techniques. Stock trading simulators allow trading fake cash with real time data, enabling traders to test out various trading strategies prior to risking any real money on them.